Victor Martinez doesn't want there to be any talks about a new contract with the Red Sox during the season, according to Scott Lauber of The Boston Herald. 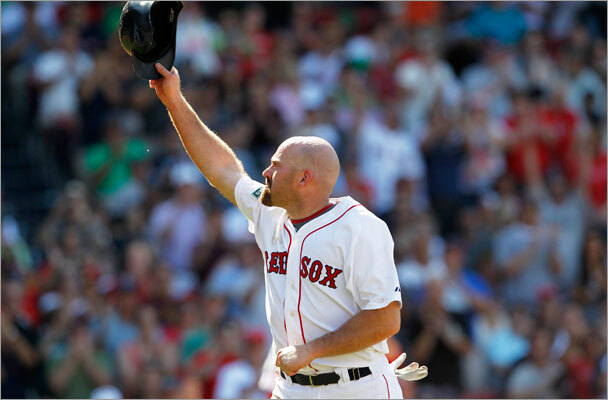 The switch-hitting catcher has maintained that he would like to remain in Boston beyond the 2010 season, but there haven't been any talks about a new deal during a Spring Training. Lauber mentions that there are reasons for Boston's apparent hesitation, including Martinez's less than stellar defense and poor throwing arm. The 31-year-old catcher hit .336/.405/.507 after coming over from the Indians at the trade deadline, setting career highs in games played (155) and plate appearances (672) as well. The Red Sox picked up Martinez's $7.6MM option back in November. Tim previewed V-Mart's impending free agency earlier this offseason. The Mets will make him a very rich man after the season. you own a baseball team? They’ll sign him by the All-Star break. Not sure how, if Martinez just said, ” No discussions during the season.” The season starts tomorrow. You do realize that Gregg Zaun is actually pretty good, right? Over the course of the past six seasons, he’s been a roughly league average hitter and a solid defender at catcher. Most teams would love to get that kind of solid production. I hope you get the clap. Also,I’ve never had issue with Zaun and wished before that they could have grabbed him as back-up when Tek was still able. Of course any star player who the Red sox do not want to resign always seems to get ripped to shreads in the press.As far as Thole or Davis or any other minor league phenom lets see if they can even hit major league pitching. I would look for Martinez to be moved at the trade deadline if the red sox are out of the race. Of course he will get the same press we have read for Garciaparra, Ramirez, Bay and now Martinez. I don’t think the Sox are the type of team to admit defeat and start moving their players… And I dont expect the Sox to be out of the race anyways. Also, the sox will probably have strong interest in Victor after the season, so trading him away would be a bad idea if they want to keep a decent relationship with him in order to re-sign him. Nomar deserved it,he acted like a spoiled child. Pedro always had issues as did Manny. None of that was ‘just the press’ if was often played out on the field. I don’t recall Bay being torn to shred but some people did point out that he was foolish for not taking what he was offered. I think the BoSox are sort of in a quandry on Martinez. You want to keep his stick, especially as a switch hitter, but he’s not a phenom defensively, behind the plate. And if you want to aggressively go after A-Gonz later, you have to leave 1B open for him. So where would they put Martinez? If he can handle full-time duties at catcher, that’s fine for 2 years. But the Sox have a kid named Exposito who is Wieters-esque and could well be due for the 25-man roster in 2012. Committing to Martinez right now, on a long-term basis, is difficult for us. You move him to DH if Exposito works out, they could just as easily shift Martinez to DH. I’m not saying they should throw bucketloads of cash at him or anything, but if he can be signed for a reasonable cost, then we’re better off signing him and making him an overpriced DH in a couple years than not signing him and being pretty much screwed at the catching position until one of the catching prospects develops, if one does at all. You guys aren’t satisfied with just Jason Bay huh? O well, I really think he will resign with the Red Sox anyway. I just don’t think we have anyone readily available to replace him.